"Recognition Matters!" is a monthly publication that provides managers and supervisors with valuable information they can use to recognize and motivate their team. 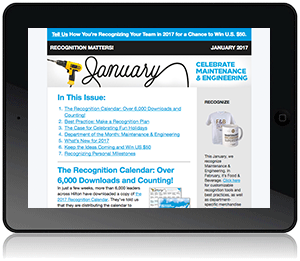 You'll find customizable tools, tips and best practices, information on the latest recognition programs, and more. Sign up today — and put the power of recognition to work for you! This Month’s Issue of "Recognition Matters!" Celebrate International HIGH FIVE Day. Important Catch Me at My Best updates and new tools. Plus, tips for recognizing our departments of the month: Laundry-Linen and Administrative Professionals. Read newsletter. View past issues for more valuable recognition ideas.